Cat lover is behind a change in his city’s pet ordinance. Now he can get that third feline. 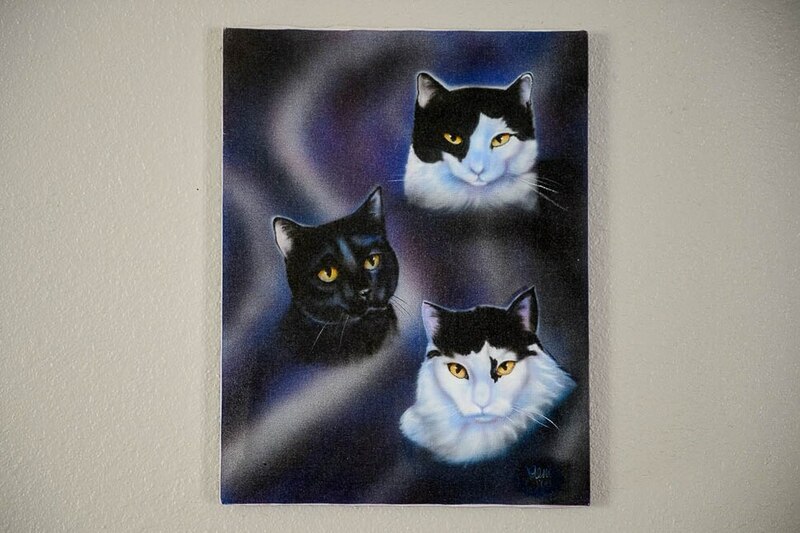 (Trent Nelson | The Salt Lake Tribune) A painting in Jim Vesock's West Valley City home depicting three of his previous cats, on Wednesday March 13, 2019. 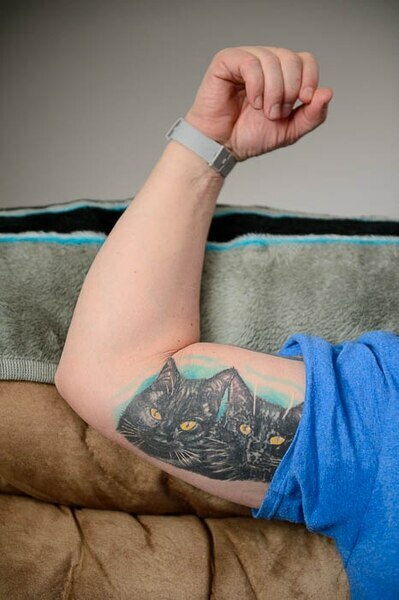 (Trent Nelson | The Salt Lake Tribune) Jim Vesock displays a tattoo of his pet cats, Raidan and Raidat, in West Valley City on Wednesday March 13, 2019. 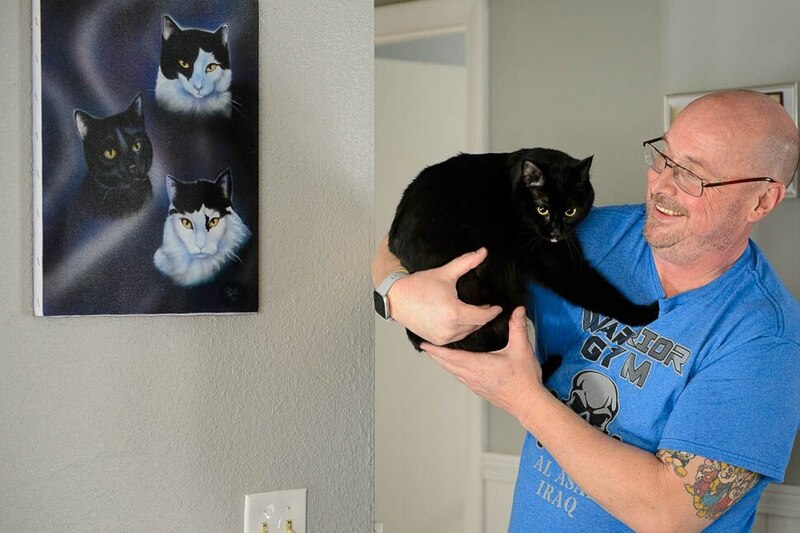 (Trent Nelson | The Salt Lake Tribune) Jim Vesock with one of his pet cats, Raidan, in West Valley City on Wednesday March 13, 2019. The painting at left depicts three of his previous cats. (Trent Nelson | The Salt Lake Tribune) Jim Vesock displays a tattoo of his pet cats, Raidan and Raidat, in West Valley City on Wednesday March 13, 2019. West Valley City residents will have the opportunity to own up to four cats or dogs thanks in part to the determination of one cat lover. Last November, Jim Vesock went to the city’s pet shelter to adopt a sister for his two black cats but was told that this was not possible. The city’s code allowed for up to four domestic pets in a household but a maximum of two cats and two dogs. The shelter told him that the only way for him to adopt a third cat was to get the City Council to change the ordinance. So he set to work. Vesock “went to every council meeting and the study meetings, talked to council members in the hallways and after almost six months got it [the code] changed,” he told The Tribune in an interview. The relaxed pet ordinance, approved unanimously on March 5, would allow for pet owners to apply for a permit to have up to four cats or dogs. The overall household limit of four pets would still apply (you couldn’t have four cats and four dogs) as would an exception to the limit in the case of kittens and puppies up to 4-months old. Vesock spoke on the ordinance at almost every city council meeting for the last six months, council minutes confirm. On each occasion he presented members with current numbers of cats and dogs being held at the city’s shelter. “I am ecstatic that there is a way for myself, a responsible pet owner, and other responsible pet owners to be able to adopt up to four cats or dogs,” he said. Vesock believes the change will help reduce the number of cats and dogs at the shelter by increasing adoption. Although the black cat that Vesock originally hoped to adopt in November has already found a home, he said he now has his eye on another. As soon as the city attorney gives him a permit, he said he will head over to the shelter to pick her up. He already has a name picked out: Raidas. She will be a companion to Raidan and Raidat. The trio’s names are a tribute to Vesock’s favorite football team, the Oakland Raiders.